Emma tells us about the challenges of transitioning from child to adult services. You can read part one here. It is now the month before Joshua’s 18th birthday, so we really are on the countdown to adulthood now. We have recently had a weekend with a hospital admission for seizures, which brought home some of the reality of what is to come. In the ambulance on our way to hospital there was a debate between the paramedics over whether my 17 year old son would be treated by children’s A&E or Adults. The paramedic was under the impression that, as he was still in full time education, he would still be treated by paediatrics but there was some hesitation over whether or not they would accept him, once we arrived. Apparently for our local trust, adulthood begins at 16 and, after some debate, with Joshua on the trolley, they compromised and accepted him into Children’s A&E, but they warned me, if he was admitted onto a ward, that it would need to be an adult ward. I just wanted my son to receive urgent treatment and so I accepted their contradictory and confusing distinction. In fact, when he was settled and we talked more, once they found out that he was still under a paediatric neurologist, as we had not yet been transferred to Adults, they relented and we were accepted by the Children’s ward. This confusion gave me an insight of what may lay ahead in our future, with just a month to go until this critical birthday. It seems that Joshua currently exists in an odd limbo-land. I took the opportunity once on the ward, to ask the nurses something that had been bothering me for a long time. I had been told on one of our hospital stays, that there would be no facility for me to stay with Joshua once he was an adult, if he requires any overnight hospital stays. I was reassured to hear that this was scaremongering and that this was not the case. Nursing staff would need me there to reassure adult Joshua and to act as his interpreter too. I did have a glimpse at the future though, that Children’s A&E would be preferable as, as the A&E consultant explained that there would be “fewer drunks and druggies in there!”, the prospect of which sent shivers down my spine. I was much more comfortable surrounded by murals of jungle animals and smiling children’s nurses, even though he was clearly too long for their trolleys then hospital beds on the ward. After this hospital admission, I chased both his paediatric neurologist and his children’s epilepsy nurse, to remind them that Joshua’s birthday was fast approaching. Both have now come back to me with dates when we will be introduced to the new adult specialist in March. I have also had a telephone review with the Continence Service to discuss a handover to the adult service, when a home visit will be required and no doubt, they will try to talk us out of the current continence products that we are happy with and that we fought for, for a year. We have recently had the review meeting for Joshua’s Education Health Care Plan, where both his current and adult social workers were present. There was a great deal of discussion about Joshua’s future respite and daycare, once he leaves education. At the end of the meeting, the Children’s social worker bid me goodbye and wished me luck, as she will never see me or Joshua again, which was a strange feeling. In the run up to adulthood, I keep getting these little nudges or reminders, so that I am forced not to ignore it. Thankfully Joshua’s current respite provision has some flexibility to extend his stays, to assist with his transition to an adult respite provision. I think that I have finally found somewhere that I could picture Joshua enjoying, that is just 35 minutes from home and so we have time to plan his future there and to prepare him – and me – for the changeover. I will be emotional when he finally says goodbye to his current provider and even in the EHCP meeting, my only tears came when I tried to express what their service and care has meant to us as a family. But then once that is resolved, we will have to turn our attention to the even thornier issue of how he will be occupied during the day once he leaves school at 19! Joshua does not have the capacity to go on to further studies or some form of manual employment, so it will only be about keeping him occupied and happy for the rest of his life. We will be looking to replace the role that school plays in his life currently: some reason to get up and out in the morning and somewhere where he meets and enjoys the company of his peers and caring staff, while they do fun activities. I cannot address that yet, but I know that it is on the horizon and I must not leave it until the last minute but tackle it. School will organise “taster sessions” of some alternative providers. These are big choices that we will be making together for his future and it feels a heavy responsibility to get it right for him. I am hoping that once again, I will recognise the right provision when I see it, that it will give me that sense of ‘home’ when we look around. For me, when Joshua has found the right school and respite setting, then they have both felt like home and so sadly, this birthday he will be evicted from his respite home and next year, he will be evicted from school too. Thank goodness that there is a year gap between them as to lose both on his 18th birthday, would be so unsettling and would leave us in inevitable crisis. So that is a blessing, as is the fact that we will be supported throughout the change. I was recently asked by a parent if I would advise them to get a social worker in place, now that her son was 16, in readiness for transition. Of course it would depend on how good the social worker was, but I would not want to navigate this change without somebody who knows the system at our side, fighting our corner. Because it will be a battle, no doubt, and so we need a coach shouting out advice from the sidelines and picking us up when we fall down. You can read Emma’s past posts here and on her blog Ups and Downs Mum. If there are any topics you would like her to write about let us know in the comments. We’re thrilled to introduce you to the two newest members of our sleep team, Carwyn Tywyn and Claire Cox. Hi, my name is Carwyn and I was delighted to begin 2019 in my new role as Sleep Practitioner at Cerebra. My early career background was in current affairs, both as an academic and a journalist. I was awarded a PhD in Welsh Politics at Cardiff University. After a brief period as a research assistant and academic tutor, I became Political Correspondent for GOLWG, the Welsh language weekly current affairs magazine. In this role, I was based full-time at the National Assembly for Wales during 2006-07. It was while working at the National Assembly that I became more informed about and interested in the work of the voluntary sector in Wales. Since 2008 I have worked in research and senior development roles for a number of organisations, including the Disability Law Service, Home Start UK and Mencap Cymru. My role prior to joining Cerebra was as a Regional Caseworker for the Mencap Cymru “WISE” project, which, in partnership with Cardiff Law School, provided advice and support in relation to learning disabilities. In 2018 the project was awarded the LawWorks award for “Most Effective Pro Bono Partnership”. Whilst at Mencap, I also received training in specialist approaches such as Mental Health First Aid, which has had a major influence on my outlook. I have two children, Heledd (11) and Gwyn (6). I think it is the combination of being both a parent and frontline disability caseworker, which has attracted me to the role of Sleep Practitioner. I feel very lucky to have the chance to apply and give back some of my knowledge and experience to children and parents who may be struggling in all kinds of life circumstances. In another life, I am a professional harpist, and was winner of the folk harp competition at the National Eisteddfod in 2013. Along with my daughter, I am a keen supporter of AFC Wimbledon. We saw them win at Wembley in 2016! I look forward with anticipation to my new career at Cerebra. Diolch yn fawr. I’m Claire. I am super excited to be part of the sleep team. I can’t wait to start helping families with their children’s sleep issues and empowering them to make the changes they need. After volunteering with many charities over the years I am so happy to be working for such a wonderful one! I come to Cerebra from working privately in London as a Prenatal/postnatal/Newborn care specialist, trouble shooter, Nanny and sleep practitioner. Prior to this I used to be a professional dancer which took me all over the place doing many different things! I also had my own ballet school. My partner and I have our own theatrical production company of which we are very proud of! We are about to leave London to live our dream life in Clovelly, North Devon! It’s a big year of change for me and I couldn’t be happier to be working with all of you for such a worthwhile and needed charity! Find out more about our Sleep Service. 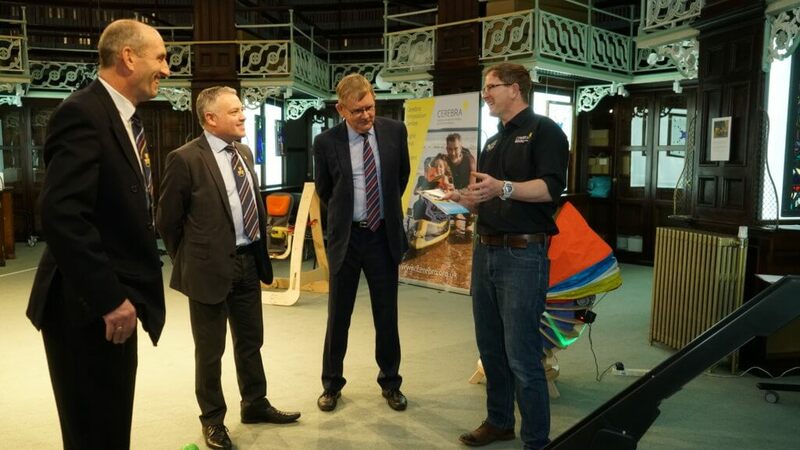 Our Innovation Centre and the work they do to help children take part in and enjoy life alongside their friends has been given a boost, thanks to a generous donation of £38,749 by South Wales Freemasons. One of the many ways we support children with brain conditions and their families is through our (CIC). At the CIC, a small team of innovators design and build bespoke products to help children overcome the challenges they inevitably face when taking part in activities that non-disabled children may take for granted. The generous grant will contribute significantly to the salary costs for the Centre’s talented design team for one year, ensuring that the Centre can continue to make a difference to the lives of children across south Wales, and beyond. Representatives from the South Wales Province visited the Cerebra Innovation Centre on Monday 28th January 2019 to learn more about the Centre’s innovative work and some of the children who will directly benefit from their support. One of the children they met was two year old Amelie from Swansea who has quadriplegic cerebral palsy. Before Christmas the team made a Bouncer for Amelie which has made a huge difference to her daily life. The Bouncer allows Amelie to move independently, something that she would otherwise be unable to do. She loves the swinging sensation and can enjoy this while the seating gives her all the postural support she needs. Mum Lucy explained that Amelie loves her Bouncer as it allows her to move on her own and have fun. The Bouncer also strengthens Amelie’s legs and core muscles so it’s great exercise for her too. Ten year old Bailey is also from Swansea and has been enjoying the Spinning Pod that the Innovation Centre designed and made for him. Bailey has a life threatening brain condition, is blind and autistic. Bailey has a great love of music and really enjoys bouncing and spinning – so the new chair is perfect for him. In the chair Bailey feels safe and cocooned and can spin it himself which is great for his independence and also for him to self-soothe when he feels frustrated. His mum Charlie explained that that the chair is his new safe place and he spends a lot of time in it playing the piano and with his toys. She added that it’s ‘Bailey proof’ – very sturdy and unbreakable! Staff and pupils from Ysgol Crug Las, a special needs school in Swansea taking pupils from ages 3 – 19, also attended the event. Head teacher Clare Hobson explained that the school has a close and long standing relationship with the Innovation Centre. You can find out more about the Cerebra Innovation Centre and view their whole product portfolio here. CIC is a partnership project with the University of Wales Trinity Saint David and is based within its Swansea College of Art.